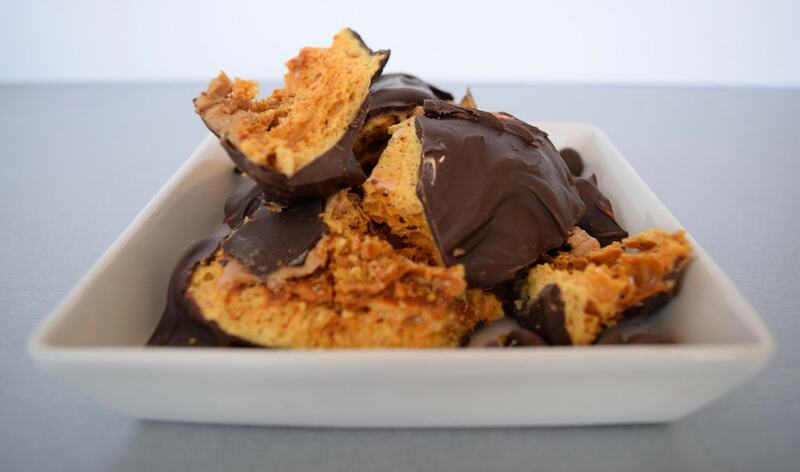 Here we’re back to honeycomb, this time, with chocolate and peanut butter. No matter how you try to spin it, there is no way to portray these as a “healthy” snack. Quite the opposite, really. There is more refined sugar in these than most things you can make at home. I suppose you could say they’re “all natural,” though that’s kind of a stretch. Before I slag these off too much, though, the real lesson here is in tempering the chocolate. I’ll explain the easy, quicker method,* leaving it up to you to look at other, more complicated methods. The magic of peanut butter. 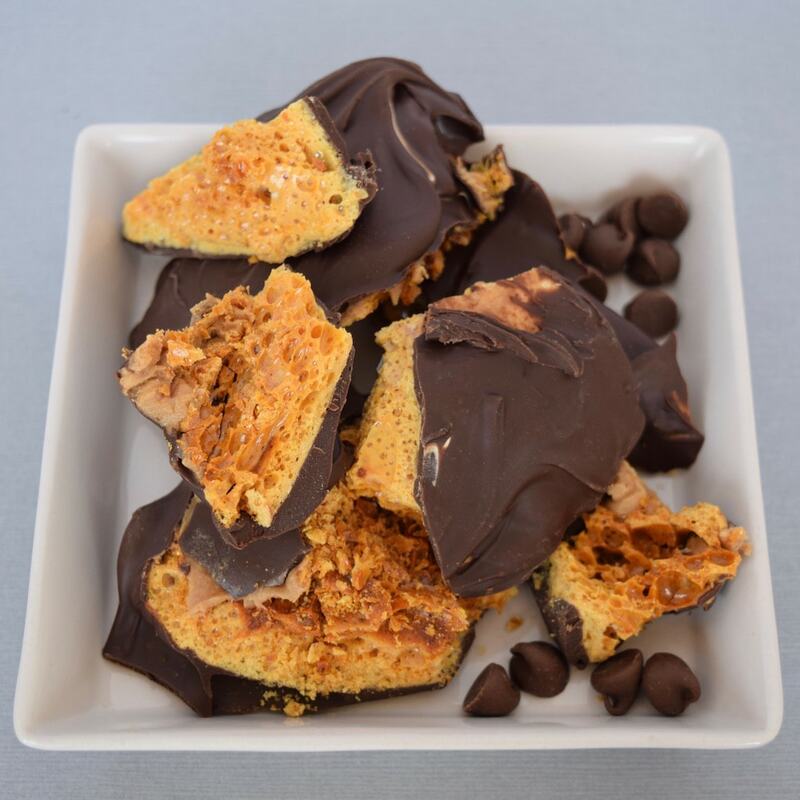 Make the honeycomb and break it into pieces. Smear peanut butter (creamy, not chunky) across the pieces, filling in the holes. You don’t need to be too carful. Just slather it on. 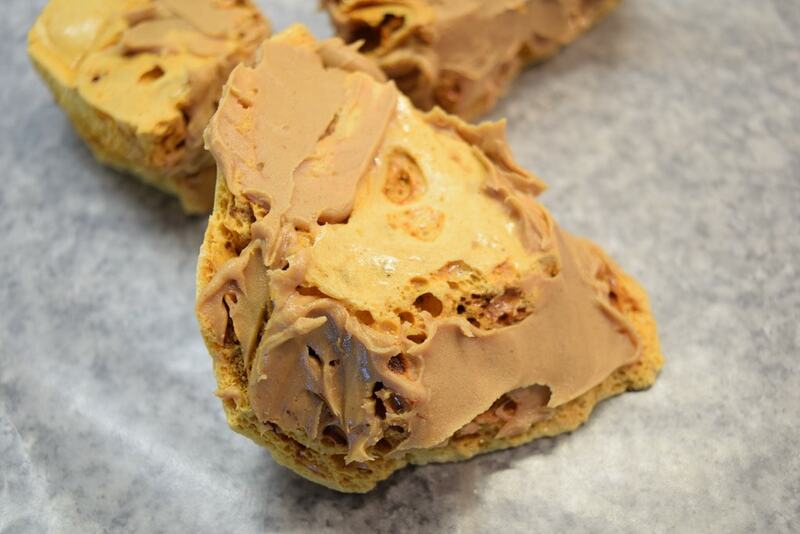 Temper the chocolate and dip the peanut-smeared honeycomb in it, before placing the pieces on wax paper. Here’s how to temper chocolate the quick and easy way. Start out with about 12-16 oz of good quality chocolate. Melt about .75 of the chocolate in a bowl over simmering water (bowl not touching the water), stirring often. When the chocolate reaches 115 degrees F, remove from the heat and gradually add pieces of the un-melted chocolate (3-4 at a time), quickly stirring after adding the pieces. As they melt, this will gradually lower the temperature, which should get down to 81 degrees. When cooled to 81 degrees, reheat the chocolate, constantly stirring, until it reaches 89 degrees. Do NOT let it get hotter than 91-92 degrees. Now you’re ready to dip.